Simple question, What is your favourite Zappa tune/ Song? Last edited by Eddie RUKidding on Sat Sep 30, 2017 1:37 pm, edited 1 time in total. hmmmm, that is a toughie/could never pick just one. I always think the best criteria for how much you like a song is HOW OFTEN DO YOU ACTUALLY LISTEN TO IT. By that measure, for me, it's Echidna (original Roxy version), hands down. It's like chocolate with me: sometimes I deliberately don't play my favourite songs because I don't want to overplay them. Private Eye by Dog Fashion Disco is one instance. Lumpy Gravy is another. Yep Lumpy Gravy is a fav of my too. 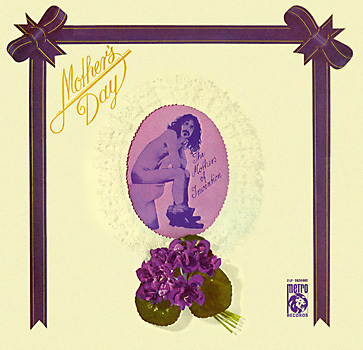 Have a guilty secret, my fav Zappa album is Mothers Day - picked up a copy about 10 years ago and is my go to for early Zappa as provides a great collection of songs from Freak Out, Ab Free, Cruzin, Lumpy and Money..
Last edited by Eddie RUKidding on Tue Oct 03, 2017 12:39 pm, edited 1 time in total. I agree. You get a lot for your money with GP. Gotta admit it is hard to single out just one but having said that I find I really like to listen to the original Trouble Every Day...not so much for the music as it is frankly...quite repetitive...but those words are just...excellent...and sadly...still timeless. I always figured FZ wrote GP to drive someone out of the band. It's a perfect piece for that. Kind of like Ian Anderson writing Clive Bunker out of Jethro Tull with Thick As A Brick. Zappa was clearly in no hurry to release GP after he finished it. We know that much. Think you got it in one. So was Ian's piece Passion Play? Last edited by Thatfabulousalien on Thu Oct 26, 2017 5:48 pm, edited 1 time in total. That is truly some amazing songwriting! Zappa's Greatest Hitz! Let's make it vinyl and pretend it was released in 1980. It’s almost impossible to choose just one song but if my life depended on it, I’d go with Strictly Genteel.